Why Undercover Tourist for tickets, rooms, car rental and more? If you have received my Vacation Strategy, you know that I recommend Undercover Tourist for discounted tickets and more. They are one of the most trusted third party discount travel company. If you have not seen the vacation strategy just click here. The prices are Great….website is very easy to navigate. Everything is done ahead of time, no standing in line at the gates. AND the people at UT are SUPER NICE, professional and friendly to deal with! I love this site and tell Everyone about it!!! You saved us over 160 dollars on tickets to Disneyworld… that’s money I can spend while we are there! Purchasing was simple, well explained, and shipping was fast. Although we don’t go to Florida often, when we do we will use your great service again. There is many ways this can happen but mostly through having a solid plan that includes knowing exactly what you want to do and giving time to not be rushing around. I will share this story to inspire you to pause a moment during times touring the park because that is when special moments like this happen. We were later in the afternoon and we were still looking to meet Tinkerbell (when she was still in her Nook with Periwinkle) and my daughter also wanted to meet Merida (who was newly after Brave came out), but we did not have time to do both because the line for Tinkerbell Nook (not on Fastpass) was 1 hour and the meet and greet for Merida was ending in 45 minutes, so we stopped before getting in line for Tinkerbell to make a decision. A tough decision for a 10 year old this was but as we were discussing, a cast member overheard the convo and approached us and another family that may have been having a similar discussion. She told us to follow here which we did to a back door. This magical back door led us to the front of the line. It was certainly one of the most magical moments for us that we will never forget. As soon as we were done which took all of maybe 10 to 15 minutes, the same cast member urged us on to go find Merida, which we were now able to fit in the schedule without any disappointment. I share this to say, if we had not had the plan in the first place, we would not have had the need to stop and have that discussion in front of a cast member and would have missed this magical moment that we will remember for a lifetime. Not to say these happen all the time, but if you allow for them, they can and will at some point. We did the Christmas Party years ago and it was fun. It is a must do if you have never experienced it. 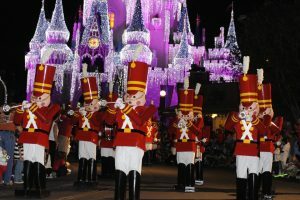 Snowing on Main Street in Florida-fun, Minnie and Mickey in Christmas outfits, the parade, dance parties, cookies, hot chocolate -all fun. The amazing Christmas themed Fireworks-also amazing. Disney does it great, not to mention getting into the park at 4pm with your hard ticket and not using your regular tickets saving theme for another day – definetly worth it. You can do other stuff during the day or do like we did and go the first night you arrive. The kids did get pooped out before then but it was definetly one to experience. If you are going and want to save on your ticket, use the link below. Save up to $10 on Mickey’s Very Merry Christmas Party Ticket! What works best for your family? Welcome to Best of WDW. This has been a long time coming and this will be the place to come. We will be linked with Facebook, but with this now, we will be able to get our message out of where to find the best in planning your Magical Vacations. I am excited about this and I hope you are too. Please like, comment or share this page. Thank you for being a friend of Best of WDW. This blog is run by Doug Hammack. I am an avid fan of Walt Disney and the magical world he created in Florida. I am a Success Builder not only in vacation planning but also as a marketing entrepreneur.